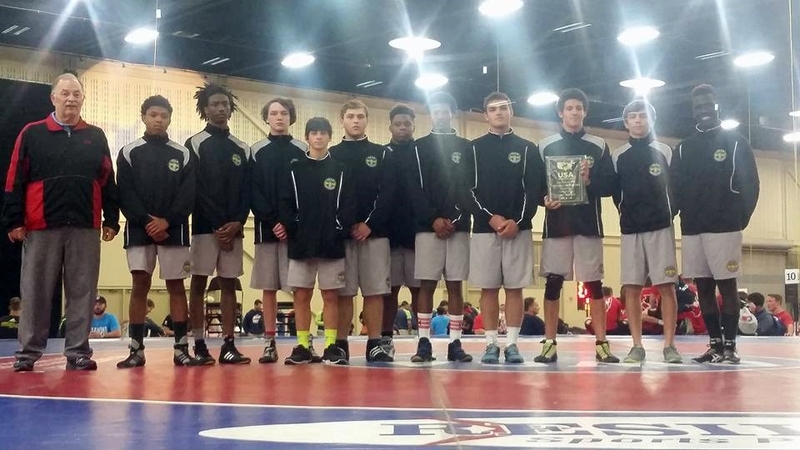 Entering the Junior National Duals as a member of Team Louisiana with limited national experience, I did not know what to expect. I knew the competition would be very tough and it would take an optimum performance to win more than two or three matches. Yet we were still fairly surprised when we were nearly shut-out more than once. It was to be a battle all week long. The first task, of course, was making weight. The first weigh-ins were for the Junior National Duals Greco-Roman competition. Usually, wrestlers cut down to a relatively comfortable weight class. But we were cutting more than usual in an attempt to be a stronger, leaner and an all-around better conditioned team. Several of the team members, though, had a very hard time making weight, and three of them actually missed their weights. 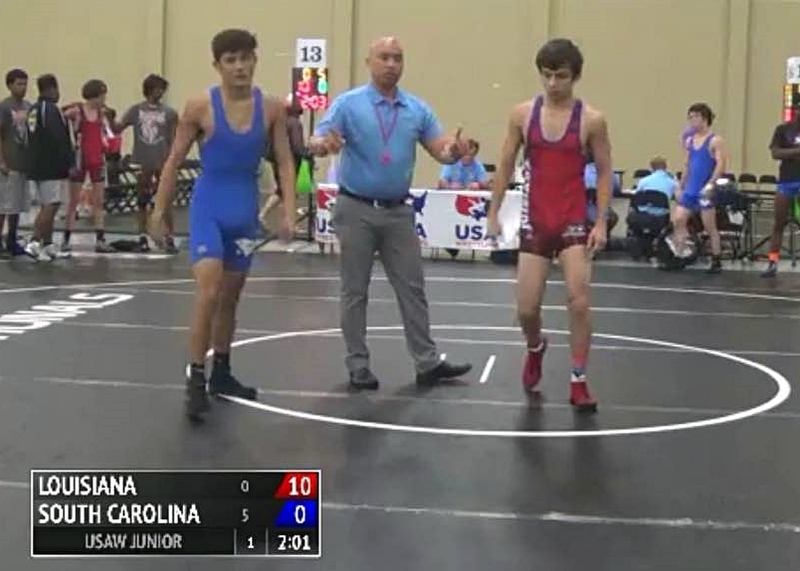 We were to weigh-in again two days later for the Junior National Duals Freestyle competition, so for those that missed weight for the first event, all hope of competing was not lost. After weights were made (and missed) we made our way to our first dual of the Greco-Roman tournament. This, for me, was a very interesting first experience of real Greco-Roman wrestling. I saw moves that I have never seen in Louisiana. We lost our first dual pretty badly to Team Florida, and that was a little discouraging. 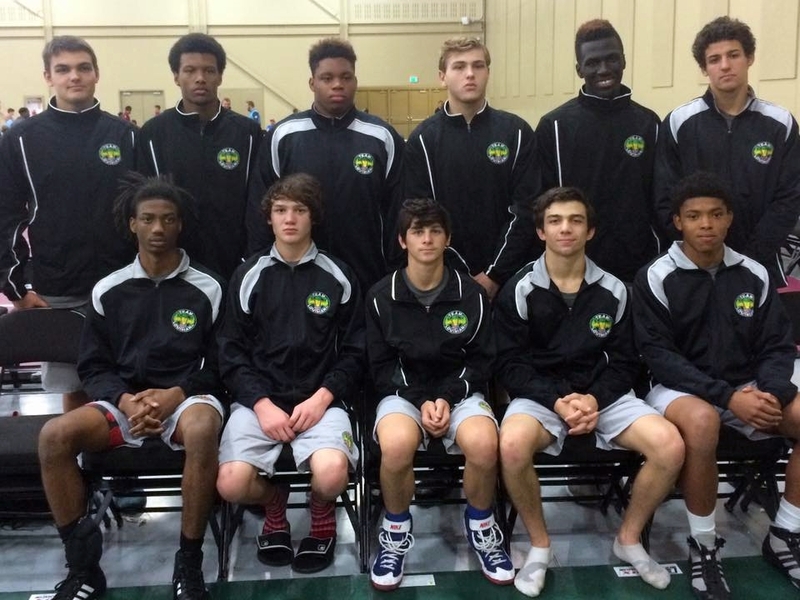 We learned the difference between being some of the top wrestlers in Louisiana to just being at the tournament and not really competing for a top placement. Something like that is tough to just brush off one’s shoulder - at least it was for me. The team were pretty disheartened by the loss, but it helped us learn that there are people much stronger, faster and just plain better than us in other areas of the country. We do not have to stay at this level, though. We are all capable of taking on higher levels of competition, no matter where our opponents may be from and no matter how good or bad we are now. What matters is how skilled we may become in the future. In order to take people of this skill level head-on, we must train, train and train some more. We learned that our training for this tournament was not enough; we were not prepared. Knowing that, this event was a good lesson. It made us realize that we still have work to do to be ready for the upcoming high-school season, and what we need to do to compete at higher levels of competition in the future. We went throughout the rest of the tournament winning one match here and one match there, growing a little better after every win AND loss. We did not win a Greco-Roman dual. We really, really wanted to, but we could never get just the right set of wins and losses to leave the points in our favor. That's all right, though, because next year Team Louisiana will be more ready than we were this year, and we will win some Greco-Roman duals. There was one upside to the Greco-Roman tournament, though, besides gaining experience and getting better. We won, for the third year in a row, the tournament's Sportsmanship Award. Coach Ballantyne made sure that even if we didn't come home with a win, we would come home with this honorable award. From handing out Mardi-Gras beads before every dual to taking every win and loss with pride and dignity, he made sure we took every possible step in assuring that we win this award. No matter what else happened during that tournament, only one out of thirty-three teams went home with this award, and that was Team Louisiana, again. After the Junior Duals Freestyle weigh-ins, which were in the afternoon after the Greco-Roman tournament ended, we ate. I gained seven pounds and then went to bed fat, happy and ready for the tournament that awaited us the next day. I wish. Coach Ballantyne made sure that we all ate right and in just the right amounts. I agree with this strongly. I've learned from experience that the food you eat at 5:00 p.m. after weigh-ins will still be in your stomach at 1:00 p.m. the next day when you need to be light on your feet to wrestle. It is very hard to be light on your feet when you have four or five pounds of food sitting in your stomach. The author walks off of the mat after a 10-0 technical fall over a South Carolina opponent. In the freestyle tournament the team did better, not much better, but better. We won a lot more matches than we did in the Greco-Roman tournament. Our first dual was against Ohio, who the next day would be one of the teams in the finals. We scored only four points, but as this was one of the best teams there, that did not get us down. We still had our heads in the game and were ready to get some wins. This was freestyle after all, and anybody can take someone down, right? The problem that we were having was one Coach Ballantyne had warned us of days before we got to the tournament. On our feet we were exceptional, but when we would get taken down the match ended right there 80-90% of the time. We could not stop them from turning us. I suppose we thought we would be just fine since we could stop people from turning us in Louisiana, but that was not the case. Even with this problem, though, we ended the tournament with wins against South Carolina, Indiana, and Montana. Going into the tournament, I only really knew two of my teammates. At the end of the week-long event I had become close friends with every single person on the team. For those that know me this may not be such a surprise, as I am a very social person. But even the shyest of all the teammates became part of this group of friends that will know and remember each other for the rest of our lives. The experience of this brought together wrestlers who would normally never have talked to one another, and made them a close knit family. This tournament was an amazing experience for me and many of the other first-time Team Louisiana members. None of this would not have been possible, however, if not for three people. Mr. Jim Ravannack provided amazing and high quality gear for us. I would also like to thank Coach James Ballantyne and Coach Patrick Mahoney. I know that they take a lot of time out of their own personal lives to do things like this for the wrestlers who want to do it. Without them this amazing opportunity would not have been possible. They turn wrestlers like me and others into young adults and, hopefully, future champions. Gavin Christ will enter his sophomore year this fall at Basile High School. As a freshman, Christ compiled a 23-1 record, with his only loss being an 11-7 Ken Cole Invitational finals match against a good friend in Comeaux senior Seth Oubre (who later placed third in Division I). During the season he twice defeated the soon-to-be 2016 Division II state champion, and twice a returning 2015 Division III state champion. At the 2016 LHSAA State Wrestling Championships in Bossier City, Christ won the Division III 120 lbs. weight class and, by virtue of winning his four matches via three falls and a technical fall, was voted the Division III Outstanding Wrestler.